It's been a big old year for new cameras, with over 100 making their debut onto the market. Included in that number is more than 75 compacts, 13 compact system cameras and 7 DSLRs or DSLTS. So, let's take a look at the kit that Canon, Nikon, Panasonic, Samsung, Sony, Olympus, Fujifilm, Casio Pentax, Sigma, Ricoh and Polaroid unveiled in 2011. We've also included links to the full review (where applicable), should you decide that 2012 is the year to take the plunge and buy a new camera. In terms of DSLRs and DSLTs unleashed on the market, it comes as no surprise that this is the arena we've seen the fewest releases. Canon and Sony have led the pack, with three releases each, while Nikon, which has perhaps been busy with the introduction of its first compact system camera, only unveiled one. All the way back in February, Canon upgraded its entry-level SLR line, with the introduction of the Canon EOS 1100D and the Canon EOS 600D. The 1100D replaced the three-year-old 1000D and features a 12.2 million pixel CMOS sensor and 720p HD video recording. The 600D meanwhile features an 18 million pixel CMOS sensor, with full HD video recording and ISO expandable up to 12,800. More recently, in October, Canon catered for the other end of the spectrum with the unveiling of the Canon EOS 1DX. The camera, which now sits at the top of Canon's line up, replaces both the EOS 1D Mark IV and the 1Ds Mark III. Packed with a 18.1 million pixel full-frame sensor, it won't actually be available until February so you have a while to save up those pennies yet. Read our Canon EOS 1100D review, or Canon EOS 600D review, or our Hands-on Canon EOS 1DX review. Sony brought three new cameras featuring its innovative fixed translucent mirror technology to the market. First up was the Sony Alpha 35, with its 16.2 million pixel CMOS sensor, electronic viewfinder and ISO expandable up to 12,800 back in June. In August, two more SLT cameras were announced. 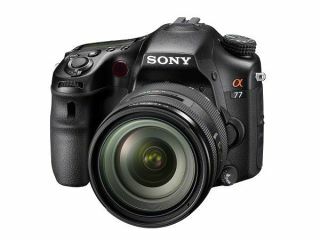 The most exciting (and expensive) being the Sony Alpha 77, which boasts a 24 million pixel sensor, replacing the Alpha 700. Other interesting specs include a 19 point autofocus system, 12fps continuous shooting and Full HD video recording. The a65 is the a77's little brother, it shares many of the core features, including the 24.3 million pixel sensor, but has a more attractive price. Read our Sony Alpha a35 review, our Sony Alpha a65 review, or our Sony Alpha a77 review. Last-up in the DSLR introductions this year was the Nikon D5100, debuted back in April. Featuring the same sensor and processor as the D7000, this beginner friendly budget model also features a 16.2 million pixel sensor, an articulated screen and an 11 point autofocus system. Read our Nikon D5100 review.